A debut in 2000 in Phnom Penh, Australia’s Jian Fang Lay emerged the biggest surprise name on the opening day of play, Friday 28th September, at the 2018 Uncle Pop 2018 ITTF Women's World Cup in Chengdu. The no.20 seed, the lowest ranked player in the whole event; the 45 year old pen-holder, against all odds, finished in first place in her initial phase group. After having experienced a close seven games defeat in her opening contest against Canada’s Zhang Mo, the no.11 seed (6-11, 11-8, 9-11, 11-8, 8-11, 11-6), she overcame Hungary’s Georgina Pota, the no.15 seed in five games (11-7, 11-6, 11-2, 10-12, 11-5), a contest in which we wondered if she had missed her chance when surrendering one match point in the fourth game. Crucially, in the immediate preceding contest, Georgina Pota had beaten Zhang Mo in five games (11-7, 11-6, 7-11, 16-14, 12-10); thus games ratio decided the outcome. It was first place for Jian Fang Lay (7:5), followed by Georgina Pota (5:5) and Zhang Mo (5:7). It is the first time in what is now seven attempts that Jian Fang Lay has qualified for the second stage at a Women’s World Cup; in fact it is only the second match in what is a total of 17 contests that she has ever won! Notably her only prior victory was against Nigeria’s Olufunke Oshonaike on debut 18 years ago. Moreover, she becomes only the second player from Oceania to progress to the main draw and to secure first place in her group in the history of the competition, which started in 1996 in Hong Kong; the other is New Zealand’s Li Chunli. In 1997 in Shanghai, Li Chunli finished in second place in her group behind China’s Li Ju, eventually finishing in third place. In the penultimate round she lost to Wang Nan, like Li Ju from China and the eventual winner, before beating Canada’s Geng Lijuan in the third place contest. The following year in Chinese Taipei, Li Chunli topped her group but experienced a quarter-final defeat at the hands of the host’s Tong Feiming. Now two decades later, a pen-hold grip player like Li Chunli but totally different in style, her close to the table play, blocking the ball most effective when using the side of the racket on which she uses long pimples, prevented Georgina Pota finding a rhythm to her play. It was a bemused Hungarian who departed the arena. 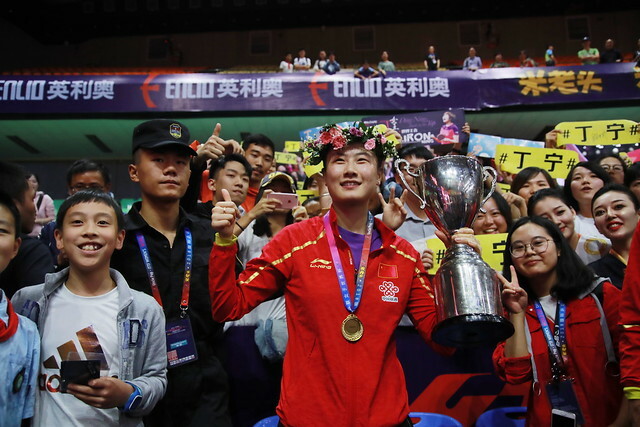 Success for Jian Fang Lay and on the adjacent table, there was success for Austria’s Liu Jia, the no.16 seed, the only player in the tournament who, present for the 13th time, has made more appearances in the Women’s World Cup than Jian Fang Lay. She accounted for Wu Yue of the United States, the no.19 seed, in seven games (11-9, 9-11, 9-11, 8-11, 11-4, 11-8, 11-3) to reserve second place in her group behind Romania’s Bernadette Szocs. Play in the main draw commences on Saturday 29th September.